Promote the development of a viable ecological survey and assessment industry. A Certified Practicing Ecological Consultant (CPEC) will be recognised by the industry, government authorities and the community as ethical, experienced, respected within the industry, licenced and insured. Have at least five years of consulting experience in a relevant ecological field during the past 10 years. Commit to ongoing professional development (Information Sheet 1: Ongoing Professional Development) and demonstrate commitment to maintaining an appropriate understanding of current and scientifically robust ecological assessment methodologies. Demonstrate that you are respected by peers within the ecological consulting industry by the provision of two recommendations from full members of the ECA NSW, and two from within the applicant’s area(s) of particular interest. Provide a written statement of 500 words outlining your career achievements and particular ecological interests. (Attendance at a meeting with the review panel maybe requested on a case by case basis). 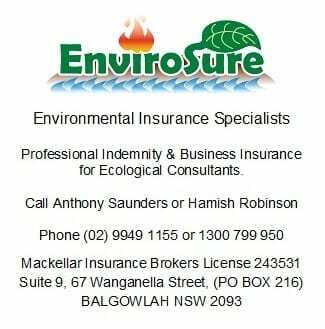 Provide evidence of appropriate licences and approvals to undertake ecological work in NSW and carry Professional Indemnity Insurance applicable for your area of consulting. Be willing to Sign the ECA (NSW) Code of Business Practice, Professional Conduct and Ethics and to uphold the beliefs as set out in these documents. The following is a list of current applicants who have applied to become Certified Practising Ecological Consultants by the CPEC Panel. The names of these applicants will be displayed here for a period of 30 days, during which time public submissions may be made on the proposed certification of these applicants. All submissions will remain confidential. After consideration of any public submissions the CPEC Panel will decide which applicants are deemed certified. More details on this section may be found in the documents available on the ECA Website, including examples of acceptable Ongoing Professional Development and documentation required for submission with your CPEC Application. The following 6 criteria are to be met in order to be eligible to become a Certified Practising Ecological Consultant. Be a Practising Member of the ECA and / or signed the ECA Coade of Business Practice, Professional Conduct and Ethics. Have good written and oral communication skills and have a good understanding of ecological processes within Australia, particularly NSW (provide a written statement of 500 words summarising career and relevant interests). You may need to attend an interview if requested. Please indicate below which documents you will provide to support your application. Signed copy of the ECA Code of Business Practice, Professional Conduct and Ethics. The Code may be found on the ECA Website (Criteria 1). If you would rather email supporting documents to admin@ecansw.org.au please check this box and proceed with email. To lodge your application, fill in the payment options below and press submit. If you wish to pay via Paypal (credit card accepted) you will be given the options on the next page. If you wish to pay via a different method your registration will still be submitted without a payment and you will need to make a direct deposit payment or post a cheque within 14 days of lodgement. If the name on the on-line payment is different from the applicant, please specify here. Leave blank if the names are the same.